I love cold treats in the summer time. What I don’t enjoy, are the calories that are typically associated with cool summer treats. One of my go to snacks in the warm months are frozen grapes. Red, green, it doesn’t matter. I love them frozen. I remember my grandmother used to make sugared grapes by coating them in sugar before freezing them. They were amazing. Then, just the other day, I had a friend suggest I use sugar free gelatin to coat them. The look on my face must have been priceless, because I stopped everything and went home to give it a shot. But holy cow, once they were ready it was nearly impossible to stop eating them. For this I let my kids do all the work. Even better a snack when someone else makes it. We used one pound of red grapes. Removed them all from their stems and placed them into ice cold water. Once they were cold and clean I used a colander to drain the water. Then, easy as pie I began to sprinkle Jello on top. We used tropical punch (sugar free, woot!) on these. 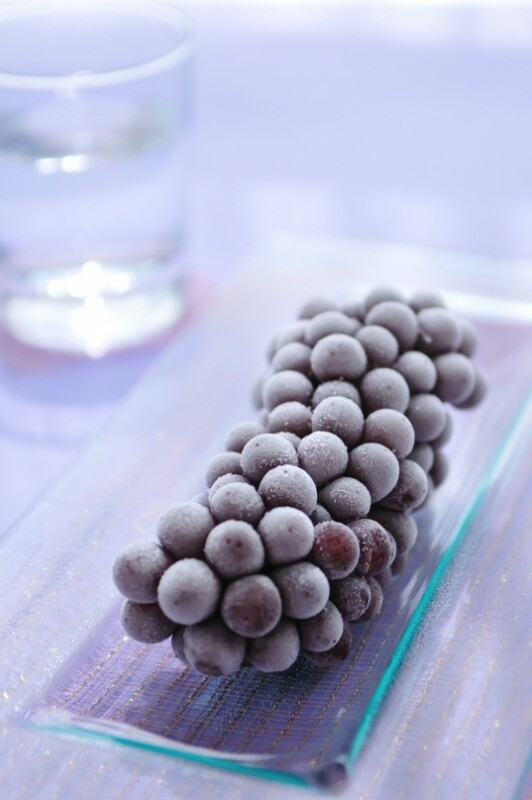 Once every grape had a good even coating we put them on a cookie sheet and put them in the freezer. It takes about two hours to get them completely frozen. But holy cow, once they were ready it was nearly impossible to stop eating them. I was a planning on bringing them to a family barbecue tomorrow, but whoops, they are all gone. I am excited to give other flavors a shot as well with green grapes. So simple, and so satisfying!